Elliot Clan BadgeThe Elliot badge is a raised fist holding a sword. It is very likely a form of short sword called a “winger” which was used in the Borders by the lightly armed cavalry known as “mosstroopers”. The words, “Fortiter Et Recte” are stamped into the leather belt, surrounding the fist. Who can wear the Clan badge? The chief wears a crested badge surmounted by three feathers. It was the practise, however, for chiefs to allow their followers to wear the crest and motto in a silver strap-and-buckle badge. This is the clansmen’s badge and if you are a member of the clan you may wear it. If the clan lacks a chief, no badge is worn. There are two different versions of the Elliot tartan available today. Although very similar, the two vary slightly. 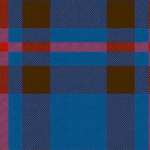 The modern tartan and the ancient tartan vary in the intensity of the colors. The ancient version uses lighter colors, as the dyes were made from plants and berries. The dark stripes appear to be a dark burgandy or brown, and the blue is a lighter shade. The modern version (pictured at right) makes use of the stronger, modern chemical dyes and therefore result in a brigher, bolder color. On this one, the dark stripes appear almost black, and the blue is almost a saphire blue. Also, the width of colored bands differs, with the ancient tartan being more condensed, with finer lines. “Regarding the tartan, the truth must come out. Scottish people have been associated with plaids for centuries. However, very few of the plaids were associated with specific families, regions or regiments historically, with notable exceptions such as the Black Watch tartan. Plaids were chosen on the basis of individual taste and not based on family affiliation, much as you would buy a suit today. During this time of “Scottish revival”, George IV made a tour of Scotland. Although grossly obese, he liked fancy clothes and proudly wore the Royal Stewart tartan. He held a great ball for the leading families of Scotland, who all wore traditional Scottish dress. Most family tartans are the plaids that were chosen by the Clan Chief to wear to this famous ball. In our case, the tartan is the one that was worn by the Earl and Countess of Minto. While not the Chief, the Earl held the highest aristocratic rank. Therefore, it is not very ancient, but it is official and now registered as our clan’s tartan. Historical tartan information was graciously provided by Mr. R. D. Elliott, former Central Ontario Chapter Chair. Copyright 2018 Elliot Clan Society USA | All Rights Reserved.